We’d love your help. 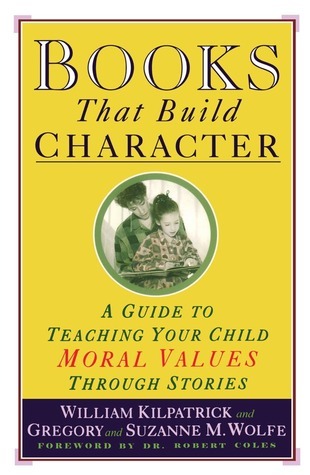 Let us know what’s wrong with this preview of Books That Build Character by William Kilpatrick. There are more than 300 titles to choose from, each featuring a dramatic story and memorable characters who explore moral ground and th Here is a family guide to classic novels, contemporary fiction, myths and legends, science fiction and fantasy, folktales, Bible stories, picture books, biographies, holiday stories, and many other books that celebrate virtues and values. There are more than 300 titles to choose from, each featuring a dramatic story and memorable characters who explore moral ground and the difference between what is right and what is wrong. These books will capture your child's imagination, and conscience as well-whether it is Beauty pondering her promise to Beast, mischievous Max in Where the Wild Things Are, the troubled boys of Lord of the Flies, generous Mr. Badger in The Wind in the Willows, or the courageous struggles of such real-life characters as Frederick Douglass and Anne Frank. To ask other readers questions about Books That Build Character, please sign up. Great reference book to have of many wonderful books that children can read with their parents or as a family throughout their time in our homes. After sixty pages of solid reasoning for what and why in the moral story arena, there are wonderful, detailed summaries of each book as well as being separated into themes and then relisted at the end for easier perusal without any summaries. I used to think I was doing just fine as the children are growing, in teaching them morals and truths, but as t Great reference book to have of many wonderful books that children can read with their parents or as a family throughout their time in our homes. After sixty pages of solid reasoning for what and why in the moral story arena, there are wonderful, detailed summaries of each book as well as being separated into themes and then relisted at the end for easier perusal without any summaries. I used to think I was doing just fine as the children are growing, in teaching them morals and truths, but as this author says, "Stories present us not only with memorable pictures, but with dramas...We literally "identify" ourselves with our favorite characters, and thus their actions become our actions. In a story we meet characters who have something to learn; otherwise we would not be interested in them." He quotes Flannery O'Connor, "A story is a way to say something that can't be said any other way....You tell a story because a statement would be inadequate." As another reviewer pointed out, the title and subtitle of this book may put people off. But this isn't a book that applies a preachy sort of moralism to the task of building a child's character through literature. Far from it. It's a very valuable guide to books that have, and will, stand the test of time as classics. I discovered many wonderful books through this guide and had a great time reading them to my children. The best children's literature is as satisfying on an adult level as it is f As another reviewer pointed out, the title and subtitle of this book may put people off. But this isn't a book that applies a preachy sort of moralism to the task of building a child's character through literature. Far from it. It's a very valuable guide to books that have, and will, stand the test of time as classics. I discovered many wonderful books through this guide and had a great time reading them to my children. The best children's literature is as satisfying on an adult level as it is for the child. This book is valuable not only for the lists and summaries of good books for children (grouped by age level and category) that takes up most of its pages. The first 60 pages contain five short chapters on the importance of reading for children and of selecting the sort of books that will build their character and intellect. It explains why it does matter what your child reads (not just that they read). Don't skip this reading. No matter how convinced you are of the importance of good literature for a child's development, your conviction and understanding will deepen by reading what the authors have to say in this introductory material. This is my favorite of all the 'what to read to your children books.' I'm eager to get it circulating for my grandchildren. I made me a book list from recommendations. That will be my next personal reading list. C.S. Lewis believed that "no book worth reading at age ten is not equally worth reading at age fifty." I'll reserve some of the shorter, younger reader books for reading to my grandchildren. The first part of the book talked about the value of good books. There was excellent information. This is my favorite of all the 'what to read to your children books.' I'm eager to get it circulating for my grandchildren. I made me a book list from recommendations. That will be my next personal reading list. C.S. Lewis believed that "no book worth reading at age ten is not equally worth reading at age fifty." I'll reserve some of the shorter, younger reader books for reading to my grandchildren. The first part of the book talked about the value of good books. There was excellent information. Flannery O'Connor: "A story is a way to say something that can't be said any other way...You tell a story because a statement would be inadequate." A good reminder of why Jesus used so many parables. William Bennett says there are two good things good stories provide: "codes of conduct (honesty, courage, kindness) and good examples (Abraham Lincoln, Joan of Arc). I liked this: "The great authors understood that people are brought low by common problems more often than by extra-ordinary ones. Likewise, the best of children's literature is concerned not with the latest ethical quandaries but with the perennial problems of growing up." Also: "In literature we get to meet people of different types. One result is that we become better judges of character." In spite of the heavy-handed sound of the book's title, this 1994 publication contains a handy annotated list of about 300 books and 20 videos suitable for children of various ages. The titles are organized into the following categories: Picture Books; Fables and Fairy tales; Myths, Legends, and Folktales; Sacred Texts, Books for Holidays and Holy Days; Historical Fiction; Contemporary Fiction; Fantasy and Science Fiction; and Biography. The book has handy divisions of reading level: younger, In spite of the heavy-handed sound of the book's title, this 1994 publication contains a handy annotated list of about 300 books and 20 videos suitable for children of various ages. The titles are organized into the following categories: Picture Books; Fables and Fairy tales; Myths, Legends, and Folktales; Sacred Texts, Books for Holidays and Holy Days; Historical Fiction; Contemporary Fiction; Fantasy and Science Fiction; and Biography. The book has handy divisions of reading level: younger, middle, or older readers for each title. The author reviews more than 300 books, each featuring a dramatic story and memorable characters who explore moral issues and the difference between right and wrong. Entries are arranged by category and reading level, and there is something for every age. When I really want to know what's in a book, this is the reference I use. I loved looking through the list and have read a lot of them. The picture books were stories mostly for kids not necessarily of picture book age, but Ava (5) was able to appreciate them a lots of conversation. Definitely worth a look-through for good ideas, but not necessarily a must-own. Fabulous book! As I read it I kept finding myself saying "Yes! Yes!" as if the author could hear me. Full of great principles and ideas for books for goods--a great reference book. I might have to buy myself a copy. This book provides parents and teachers with a great resource to aid in assisting children with choosing books that will not only amuse them but also develop their characters and prepare them for the world around them. The authors give sound advice about how to avoid the narcissistic literature prevalent on today's bookshelves. From pg 52: "It is far easier to be cynical about the facts of life than it is to invest them with the significance they deserve." I have never read a book that was recommended in this book, that I didn't just love. Some of the books were very moving with surprise endings that really threw my kids, but all the books are very thought provoking and offer a lot of food for discussion. Read this book a couple of years ago. Re-read/skimmed my highlights. Great reference book! Booklists alphabetically, by age appropriateness, and genre. Also has an appendix of good children's movies on video/dvd. Lots of good memories in the list here. Many I read to my kids when we were homeschooling. Compelling introduction based on facts. Fantastic book list beginning with picture books for youngest readers (ages 4-8). This book has listings for great books for all ages. It lists many of my favorite books that influenced me growing up and lots of others that I'm going to try out now. OK. Not thrilled with all the selections. skimmed much of the book detail, but very good list of books to read. Close to my heart. I love the message of bonding as a family through reading great literature. I am still working my way through the book list, but the narrative was inspiring in and of itself. A good guide & resource. Great resource. I think I read this in the late '90s but maybe as late as 2005. This is a great reference tool, especially for homeschoolers who are making their own curriculum. The trouble is picking from so many books. The books are listed with a review which indicates why they were chosen. The books are some of the best in children's literature. They are listed as to age and general subject in the main part of the book, but are listed with the author in the back of the book so you can print the list or make a checklist. I have used some of the books for a literature assig This is a great reference tool, especially for homeschoolers who are making their own curriculum. The trouble is picking from so many books. The books are listed with a review which indicates why they were chosen. The books are some of the best in children's literature. They are listed as to age and general subject in the main part of the book, but are listed with the author in the back of the book so you can print the list or make a checklist. I have used some of the books for a literature assignment and other I've suggested for free reading. There are so many and they are so good the kids really love them. Great resource for parents and teachers. Most of the space is devoted to lists, synopses, and helpful comments on good books, arranged by type of book and reading level. There is also a delightful section on the moral imagination. This is an excellent resource for uplifting (though not fluffy) titles. This is a great resource with thoughtful ideas for finding GOOD books for children and teens. I found this book really helpful and insightful. Lots of good tips and recommendations.